Much of our learning takes place through unit studies. 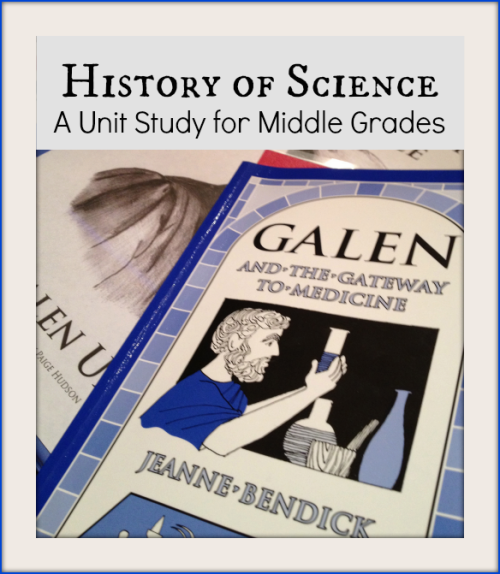 The History of Science Unit Study (focusing on the Ancient Greek Physician, Galen), therefore, was a perfect fit for my sixth grade daughter. If you are looking for a meticulously organized unit study, this is for you. If you are looking for an engaging book about a very interesting ancient figure in science, this is for you. If you are looking for a study that does ALL of the leg work for you (as the parent), this is for you. The purpose of the History of Science series is to learn about the major discoveries of science through the scientists who made them. This unit on Galen is designed to be used as a stand-alone program for a 5th to 7th grader or alongside of any middle school level science program. The study is based on the book, Galen and the Gateway to Medicine, by Jeanne Bendick. This living history book is definitely at a middle grades reading level. Students can read the book alone, or you can read it aloud to them. If you read it aloud, you will be more prepared for some of the discussion questions with your student. 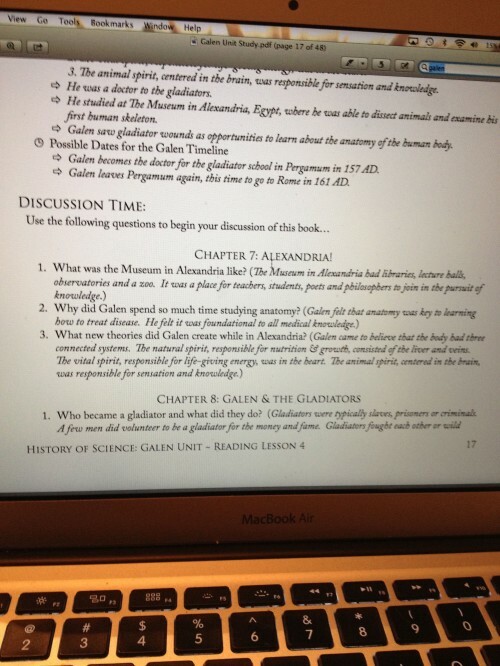 The Unit Study is broken down into 10 lessons that explore Galen and his contribution to science. After these 10 lessons, there is a report lesson, around the web lesson, and an inquiry lesson. There is a test at the end of the study, and plenty of opportunities for follow up discussion. Read the assigned chapter aloud. Define vocabulary words in the notebook. Complete the written questions to review the chapter. Fill in any pertinent dates on the timeline and any pertinent facts on the fact chart. Have Discussion Time (using the discussion questions). Of course, the study could be completed by the student alone. I have chosen, however, to read aloud and let my daughter do the rest herself. I have the .pdf of the unit study on my computer and guide the lessons. It has been such an easy way to do a unit study! It can be used as a stand alone science study, or can be used alongside your current science curriculum. Everything is laid out in the .pdf guide your receive. There are even additional links for follow-up at the end of the study. The lessons are each 30-45 minutes – a perfect amount of time for this age. This particular study on Galen was INTERESTING… living books always make for the best learning! Requiring your student to do a report in a specific format is a GOOD THING. 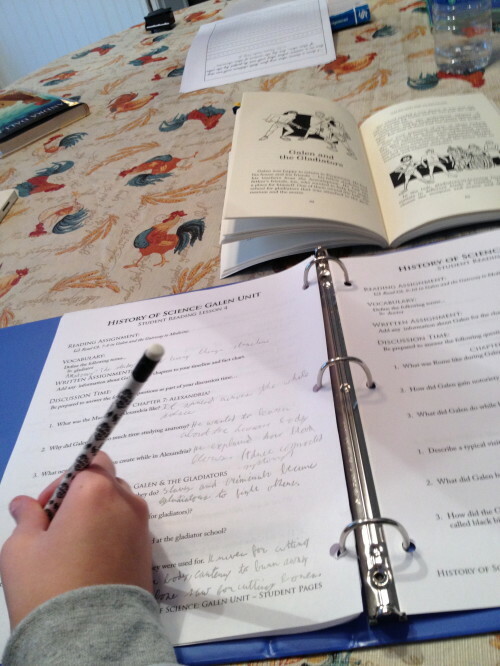 There is a finished product of a neat notebook when your student completes the study. This unit study is available through Currclick for just $6! Mary is a former public school music educator and degreed administrator. She now homeschools her two children - one middle school, and one elementary school. She runs a small piano studio and wants to make teaching music easy for the homeschool parent. Reading, writing, and swimming are things she enjoys in her "spare" time! Mary, this looks wonderful! We are reading and enjoying Jeanne Bendick’s book on Archimedes right now, so I have no doubt her book on Galen is just as good. Thanks for such a great review! Thanks, Ellen — the book was wonderful – we will definitely read more of them, and the unit study just made the learning come alive. How long would it take to go through this study?